My sleep philosophy is to do whatever is (safely) getting everyone the most sleep. Every baby is different, every family is different, and baby sleep goes through all kinds of stages. I have zero loyalty to any particular method. So in her short life, we've used the SNOO, we've done bedsharing (on and off starting around 11 weeks), we did gentle self-soothing training to get her in her crib around 5 months, we went back to bedsharing during a sleep regression (in her room this time, so that we could at least take turns getting decent sleep), and then we realized it was time to sleep train for real. Why did we decide to sleep train? This decision is so polarizing, because I know plenty of people (people I love!) who fall into fairly extreme camps on this, either feeling like the baby should never be allowed to cry themselves to sleep because they'll end up traumatized, or those who sleep trained their baby super early and never looked back and think the rest of us are crazy for not doing it. At around 5 months, it became clear to us that bedsharing wasn't working for us anymore. Before that, Adrian would happily curl up against my chest and instantly fall asleep, and sleep well for long stretches at night. But once she started rolling over, it fell apart. I think she needed more space, and when she woke up at night she'd notice us and then instead of falling back asleep she'd get excited and want to play. So we did some gentle self-soothing training and it worked! She transitioned to her crib, and sleep was up and down but overall decent for a while. She even occasionally slept through the night without waking up to eat. I could set her down in her crib at night awake and she'd quietly roll over and get into a comfy position and then just pass out. It was amazing. And then 8 months hit and we regressed, big time. She wasn't falling asleep on her own at night anymore, and we had to hold her for a long time to get her to sleep and then half the time she'd wake up as soon as we set her in her crib and we had to start over. The other half of the time she'd sleep for an hour or two and then wake up, and the only way we could get her to sleep was by lying down with her (and then staying there all night, because she'd wake up multiple times and look for us). This was slightly bearable on the nights when she actually slept decently with us, but on many, many nights she would be awake from 1am - 4am babbling non-stop and trying to play with us. A babbling, smiling baby is adorable, but not at 1am. NOTHING IS ADORABLE AT 1AM. And when we'd refuse to wake up and play with her, the babbling would eventually turn into disappointed (and exhausted) crying that could go on for an hour or more. I can't describe the level of frustration we were experiencing. When you are doing everything in your power to comfort a baby who just will not stop crying, when you are willing to feed her and hold her (all night!) and that still isn't enough somehow - on hard nights it would get so bad that we'd sometimes just have to tap out. I'd reach this breaking point and I'd have to set her down in her crib, still screaming, my teeth clenched so hard I thought my jaw might break, and D would come in and take over and we'd just trade off every few hours until morning. We both work full time, neither of us is getting any naps during the day. The only way we were functioning was by trading places each night, with one of us sleeping with her in the nursery guest bed and one of us getting a full night's rest in our bed (unless it was one of those really bad nights in which case neither of us slept much and we both wanted to die). Since D gets home around 7:30pm, there were lots of nights were we didn't even get to see each other, because I was already trapped in the nursery for the evening by 7pm. I was starting to get depressed and a feeling of hopelessness would ramp up each evening, as I wondered if I'd get enough time to wash my face or shower or eat something before I had to go to bed. I tried moving her bedtime up, then pushing it back, I obsessed about the length and timing of her daytime sleep, her milk intake, etc. - nothing made a difference. This was when we knew we needed to sleep train. None of us, including her, were sleeping well. We had to wait a couple weeks to start because she and I both got a cold that seemed to last forever, but once she'd recovered we dove in, using the Sleep Wave method from the Happy Sleeper. Basically, you come up with a bedtime routine and a reassuring script and then you lay them down awake. If they cry, you go in at 5 minute intervals and say the script, then leave again, no touching. There are a lot more details, you definitely want to read the book before attempting. (Also worth noting - this method doesn't require that you night wean, if you want to keep your night feedings which was important to me since she'd struggled with weight gain). It was hard. I heard all these stories from people who said it was heartbreaking to hear their baby cry for 20 minutes but by the third night it was all worth it! Well, Adrian cried for over an hour, for a freaking week. She wouldn't even lie down, she'd just sit up and wail, and then eventually pass out while still sitting up and then finally fall forward and that would wake her up and it would start over. 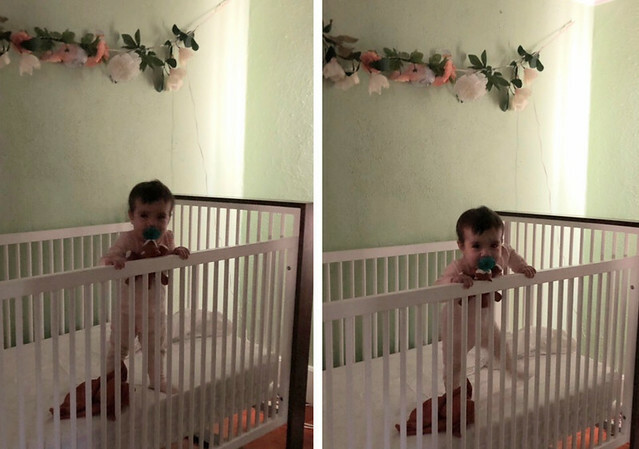 By the third night she understood that our bedtime song meant crib time, and she'd start getting agitated while we were singing to her, spitting out her pacifier and trying to climb out of our arms, crying before we'd even set her down. I can't really describe how heartbreaking this was. I felt like a monster, just writing about it makes me want to cry again. But I also felt trapped - I knew that if we stopped we'd just go back to not sleeping and I couldn't handle that either. We decided we'd stick it out for two weeks and then try a different method, but it was slowly killing me and I was worried that we were just breaking her spirit. The book even says that most babies adjust by five days. But then it started gradually getting better and by day 8 she would lie down and settle herself with barely a protest and she no longer seemed agitated or upset at bedtime. For the first month I was a crazy person and actually made us track her exact timing (when she was put down, when she would cry, when she would wake up, how many times we would go in). I also refused to ever discuss how sleep training was going, because I was terrified I would jinx it. But we're now at 11 months and bedtime has gotten easier and easier and I honestly think this was the best decision we could have made. Our bedtime routine is short and sweet and I can lie her down wide awake and she calmly plays with her pacifier and lovey for a few minutes before falling asleep. She almost never cries at bedtime unless she's overly tired and even then it's usually just a brief protest wail before she conks out. She will cry out a few times a night during light sleep cycles but she barely even wakes up, just feels around for her pacifier and puts it back in, often not even opening her eyes. She usually wakes up to eat once a night, which is pretty manageable for us since she goes back to sleep immediately after. I don't expect that this means we have a perfect sleeper on our hands for all time, and we've had small regressions when she's teething or not feeling great, but honestly, just knowing that we can do this, and that D and I can eat dinner and talk about our day and then actually get some sleep, is worth it, even if everything changes in another couple of months. Have some words of affirmation ready for yourself, to get through the crying. The main things that helped me were knowing that a) she used to cry like this in her carseat and now she's usually content in there b) we had gotten to a point where there was a whole lot of crying each night even when we were actively trying to soothe her, so that wasn't working either. There was going to be crying and frustration either way. I'll be honest and say I'm not sure I would have made it through the process if we hadn't already gotten to this point, where I knew we were in for at least an hour of inconsolable crying around 1am if we didn't sleep train. Have both people on board. D came home from work early for the first week, so that I wasn't doing it alone. We'd run through the routine, put her down, start a timer because she'd immediately cry, and then pour ourselves a drink and then take turns going in for the 5 minute checks. We wrote our script on a piece of paper and taped it up on the nursery door to be sure we were saying the exact same thing. Have a video monitor. This helped us a lot because not knowing what she was doing in there was too hard. If she was quiet, we didn't know if she was lying down asleep or just sitting up and hanging out. If she was crying, we couldn't tell if she had her leg stuck through the bars or if she was just protesting. On the other hand it's heartbreaking to watch them at first when they're crying and reaching towards the door hoping you'll pick them up. But watching how cute she is when she comforts herself by picking up her lovey and rubbing her face with it and then using it as a pillow helps. Seeing her sleep process has really helped me realize that she's a much better sleeper without us, our presence actually makes it harder for her to sleep now, not easier. We got the Infant Optics monitor because right when we were trying to decide what to do there was that story about someone's Nest cam getting hacked and it turned me off all wifi options. Decide how you're handling night feeds. We're not ready to stop feeding her at night. Her weight gain is still slower than it should be, and while I try not to stress about it I worry anyways. The book has instructions for night weaning, but is also totally supportive of not dropping feeds and has a couple different methods. You can preemptively dream feed, based on their schedule, or you can feed on demand but only if enough time has passed. I chose to feed on demand because I want to follow her lead. It worked out for me, because during the sleep regression she'd been eating every three hours at night, like clockwork. But as soon as she started sleep training she cut it down to once per night naturally, which was amazing for me. I keep a three hour interval, because I know that if she wakes up before three hours she's unlikely to actually be hungry. So if she wakes up, and it's been at least three hours since she's eaten, I'll go in and feed her (no 5 minute interval checks, although I always wait a couple minutes before going to her, because she wakes up several times a night and resettles herself within a minute or two). I know her pattern now, so if I see that her milk intake was low at daycare, I know that she's probably going to need two nighttime feeds, but if she eats enough during the day she only wakes up once per night and she will occasionally sleep straight through. I think I'll let her self-wean, but we'll see how it goes. The main thing here is knowing your baby, I think. Adrian isn't huge on comfort nursing and she's usually really good at self-settling when she wakes up at night, so I feel fairly confident that she's actually hungry when she wakes up and sits up and doesn't lie back down. There's no real rhyme or reason to her timing - if she wakes up to eat it's usually any time between 11:30pm and 5:30am, whenever she gets hungry. Figure out the right bedtime. We're still playing around with this a little, but we tried putting her down as early as 6pm and as late as 7:30, and what we noticed was that when we put her down earlier she'd usually fall asleep around 7pm, regardless of when exactly she was set down. So now we aim to set her down just before 7 and she is usually asleep within a few minutes. She tends to wake sometime between 6 and 7am, which works pretty well with our schedule (I mean, it would be absolutely perfect if she slept until 7:30am, but my natural wake time is right around 6am so I wouldn't be surprised if this is just her schedule). Side note - NAPS - we still haven't tackled naps and I have no idea if/when we'll do that. Honestly, I just can't get up the energy to care. She naps at daycare just fine but at home she wants to be held. If we hold her, she'll sleep like clockwork for 1.5 hours twice a day, and she rarely fights a nap. I just sit down on the couch with her and she drifts off to sleep, no rocking or singing or cajoling. Since that's working for now I just use it as an excuse to sit down and read and get some snuggles in. If it starts feeling frustrating or difficult, we'll figure out how to change it but right now we get so little time together that it's actually pretty sweet. Other side note - sleep aids - you'll notice in the pictures that we didn't cut out sleep aids, as most sleep training methods recommend. She uses a lovey and a Wubbanub (we have three of each - one for home, one for the diaper bag, one for daycare) to sleep and they really do help her. If she wakes up at night she immediately reaches for them and soothes herself back to sleep almost instantly. She has a strong sleep association with them because we usually don't let her have them during the day (unless she's sick or having a really hard day). Will I regret this? Who knows? We did have a mild panic last week when she discovered it was fun to throw them out of her crib in the middle of the night and then she'd cry hysterically when she realized they weren't coming back. We didn't want to go in and replace them right away, since we were afraid she'd decide it was a fun game. Instead, we'd let her cry for 5 minutes and then go in, pick her up, sneakily put them back in the crib and then change her diaper (which she does not love) so that when we set her down after her diaper change they were just there. This seems to have worked (fingers crossed) and we haven't had any throwing incidents for a few nights. Do I wish we'd done this earlier? I'm honestly not sure. As I said above, I don't think I could have gotten through the crying if we hadn't already gotten to a place where she was crying a whole lot in the middle of the night. On the other hand, maybe if we'd done it a little sooner she would have fought it less? There's really no way to know, and I don't really care at this point. I'm mostly just posting this to say that you are not a monster if you need to sleep train your baby (conversely - if you are getting decent sleep while bedsharing, this isn't an indictment of your method - I loved bedsharing, until it stopped working for us). I'll update this in 20 years if she turns out to be a serial killer because we traumatized her, but right now I'm feeling pretty good about it. I just want to validate that sleep deprivation is the worst, worst, worst thing. There's a reason it's used as an interrogation technique. I'm glad you found a good solution and hope she keeps sleeping well! We sleep trained at 4 months after I read the Baby Brain Book written by a neuroscientist who read studies on lots of different things and then gave a short summary of the studied research in each chapter. It was really good! Anyway for the sleep chapter, he said either cosleeping or sleep training are the only two things that actually work long term and that you are absolutely not traumatizing your child by sleep training them after 6 months. He gave the caveat that if you don’t stick with your sleep training method, you’re training your child to cry (they learn that x amount of crying will get them what they want and then they try to find x), so you have to be very firm with yourself. He recommended the Ferber method actually, which has gotten vilified on the internet but I then read Solve Your Child’s Sleep Problems and it seemed fine to me (Ferber said training at 4-6 months is okay and our baby wasn’t getting good sleep cosleeping anymore, so we went for it early). The approach was very similar to what you did, but the intervals grow progressively longer. Definitely not just leaving them to cry themselves to sleep for hours or anything like that! We had a rough couple of days and then it’s been fine since. We can tell if our baby actually needs something in the middle of the night or if he’s just settling himself, similar to what you’re seeing. I kept doing night feeds until he didn’t need them anymore, and I still cosleep sometimes if he’s sick or teething. One thing I found encouraging in the Ferber book was that although they can learn new bad sleep habits quickly (ie from travel or sickness) they can also learn good sleep habits quickly, so any new issues that may arise you can generally fix/reset in a couple of days. This was so great to read! I have a 3-month old and I always get an idea of the next stage from your posts. Love your humor and honesty, and I'm so glad sleep training worked for your family! This was so good for my heart seriously. My little man is 7 months and we've been sleep training since the 4 month 'regression'. Those sites that say it takes 5 days are sooooo wrong (in our case). Haha... We've been consistent and he's doing so well. I wish someone would've told me that sleep training is just a lifestyle of being loving but also consistent. Most days he's a total champ but during leaps he gets a little nuts. I'm still mostly insane when he cries but it's gotten sparse and totally doable. With 10-12 hours a night and 3 (45 min to 1.5hr) naps a day he is SO happy and that soothes my heart! Best wishes going forward!! !